Creative Diagnostics offers many antibody modification services including antibody fragmentation. Our experience in working with antibody enzymatic cleavage allows us to process immunoglobulins into their constitute components. In some assays, it is preferable to use only the antigen-binding portion of the antibody such as Fab or F(ab')2 to prevent the constant (Fc) portion from binding to cell surface receptors. 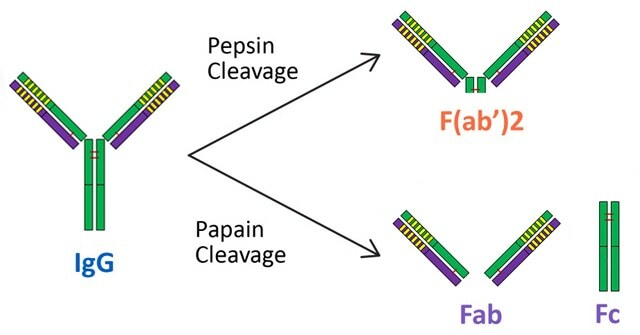 Fragmentation will be achieved by papain, pepsin or ficin digestion to produce Fab or F(ab')2 fragments depending on the final application, respectively. Generally, two step studies are included for antibody fragmentation – the first step is performed to optimize the cleavage conditions while the second step utilizes those conditions to produce the final product. Our high-quality antibody fragmentation service rarely fails to give our clients better results in experiments and other downstream applications. Whatever antibodies you want for fragments generation, mouse IgG or human IgG and IgM, please contact us and we will try our best to meet your requirement.